What does a leading machine-translation company uses to translate their own documentation and marketing material (where they boast of the high-quality translations produced by their own software)? Human translators, of course, not their own much-publicized product. But the irony doesn't stop there... the (human) translators that work on these texts may very well take advantage of some form of machine translation to help them in their task, in addition to the translation memory tools they use all the time. 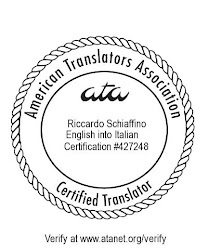 I think that in the future most professional translators will complement their TM tools with some sort of MT tool. I've already started to do so, at least for certain specific types of text (e.g., software or hardware manuals). Hi Riccardo, There are not too many good resell rights related sites that aren't full of junk posts, search engine scraping and except for keyword stuffing, nothing useful related to resell rights. It was nice to find an exception today when I happened upon your site. Keep it going.